Two Free Library of Philadelphia programs have teamed up to create new ways to advance literacy, guide learning, and inspire curiosity! Get HYPE Philly! and the Literacy Enrichment After-School Program (LEAP), offer fun, positive, and tasty ideas to all neighborhood and regional libraries through our HYPE LEAP lessons. As a fundamental part of Mayor Kenney’s Five Year Financial and Strategic Plan, LEAP is a free, drop-in program for youth in grades K-12 and currently employs a workforce of approximately 125 Teen Leadership Assistants (TLAs). TLAs work with After-School Leaders and other library staff to focus on homework help, literacy, mentoring, technology, and maintaining a safe and supportive space. Get HYPE Philly! is generally focused in North Philadelphia, where many of the TLAs at these libraries not only attend events, but support Get HYPE Philly! program faciliators as well as participating youth patrons. The HYPE LEAP lessons offer TLAs at all Free Library locations a unique leadership experience to spread the HYPE message—"Healthy You, Positive Energy!". Essentially, the HYPE LEAP lessons are youth-centered; young people create the lesson content, as well as lead activities for youth patrons. 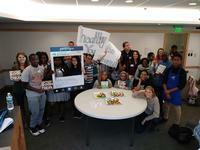 Teens who work with Get HYPE Philly! created the HYPE LEAP lesson plans to be an interactive, youth-led literacy program in line with the GHP! goal of "creating a lasting impact, helping to ensure Philadelphia’s young people play a key role in building healthier communities, and becoming a healthier generation." Participating library staff, including TLAs, are eligible to receive two ServSafe food handling certifications in addition to a fun way to encourage other youth to be HYPE! At a recent training, LEAP staff learned more about the HYPE LEAP curriculum. Focusing on the "Think Big, Think HYPE!" theme, we encouraged participants to consider ways to bring positive, relevant change to their respective libraries. Hieu Nguyen, a TLA at South Philadelphia Library and president of the HYPE Program at Central High School, was excited to find ideas that he can bring to both places. He hopes to increase his peers’ participation in the HYPE program with more ideas, and was grateful to learn about the HYPE LEAP lessons. "[HYPE LEAP] brings forth another way to connect with the community," adds Hieu. Passionate about helping others, Hieu says he plans to be a neurosurgeon. "I know there’s a lot of money in that, but that’s not why I want it," says Hieu. "I just love learning about the brain and how it works! I want to help others by understanding how the brain works, and ways to treat things like Alzheimer’s and dementia." Hieu and the rest of the LEAP staff enjoyed a day full of HYPE activities, including The Hoola Hoop Challenge and making a healthy snack: Caprese Salad Skewers. Try this recipe at home and let us know what you think by tagging us on social media: @FLPGetHYPE on Facebook, Twitter, and Instagram, or responding in the comments section below! Assemble, tomatoes, basil (roll from one end to the other), and mozzarella balls on medium-sized toothpicks. Drizzle with olive oil and sprinkle with salt and pepper. To make balsamicreduction, add one cup of balsamic vinegar to a sauce pan over medium heat. Once it comes to a boil, set on simmer for about 10-15 minutes until it reduces to a syrup consistency. You can check by dipping a spoon in the balsamic and if it covers the back of it, it's done. 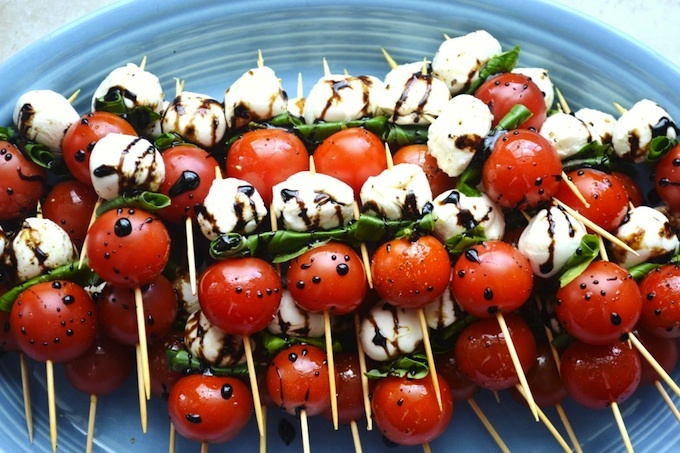 As it cools, it will thicken a bit more then drizzle on top of caprese salad skewers. Two Free Library of Philadelphia programs, Get HYPE Philly! and LEAP, have teamed up to create new ways to advance literacy, guide learning, and inspire curiosity! Add a Comment to LEAP into HYPE!